K.R. Mangalam World school does not only put its heart and soul to rise the knowledge of its kids through its unique technique of teaching but they also brings out the healthy spirit of competition in the kids by organizing wonderful creative events as well. Children have an innate love for stories. 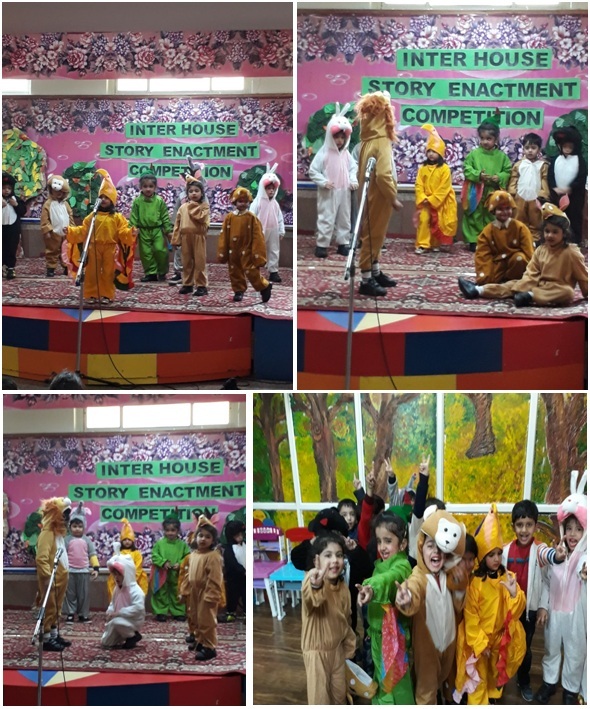 Keeping this in mind, an inter house story enactment competition was organized for the preschoolers. The children were selected from all the four houses – Ruby, Emerald, Sapphire and Topaz respectively. The participant from all the four houses enacted on moral based stories like love, Education, Happiness and Unity. The children were given different roles from the script which was then enacted and expressed in a very confident way. The young ones showcased their talents and performed their characters through their remarkable gestures, actions and dialogues. All the children participated enthusiastically. The competition inspired the children to think, work and enact creatively and promoted artistic excellence and made the event most enjoyable for one and all.